Having purchased the property of the former Methodist Church in Dublin, it was rumoured that there was a Time Capsule in the building. It had been mentioned a number of times since we moved in some 14 months ago, but these just seemed to be stories. Nor did, or could, anyone indicate its exact location. Realising that its existence would be an important part of Dublin history, it was somewhat of a dilemma. Did it exist?. If so, where & when was it placed?. I mean, with it just being a rumour, we could hardly have a major event to unveil it. I could just imagine the Mayor, Councillors, Church officials & the History Group all over the place with spades & hammers looking for the X that marks the spot. So, after having learned of all the peculiarities of the place, I decided to investigate the most likely place it could be. It was during a hot weekend in January 06 that work commenced. It took about 2 hours digging to remove the stone. Once extracted, it revealed nothing of interest at all. It was not until I was cleaning up the area that I discovered glass in the debris. And yes there was something there. 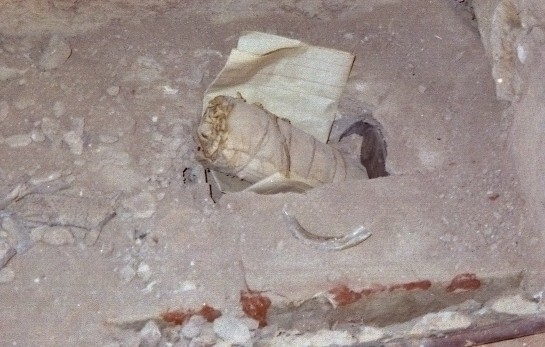 It appears that a glass jar had been buried in the mortar beneath the stone and the jar had been broken at some stage. The time capsule contained a rolled-up, (and tied with string), The Register newspaper from 24th April 1920, (the day before ANZAC Day), and a letter, (transcript below), naming and dedicating this building, (an extension to the original Church), the Dublin Methodist Memorial Hall and Kindergarten in memory of the three locals that died in WW1, namely, Private. Lloyd Francis HABNER, 10th Battalion, 2nd Lieutenant Cecil Norman PATTERSON 43rd Battalion and Private William Norval THOMPSON 50th Battalion. The finding has been presented to the Dublin History Group where copies of the soldiers records are also held. The Dublin Methodist Memorial Hall and Kindergarten is now, unceremoniously, known as the Kitchen, bathroom & bedroom, however we are not un mindful of its history however, as It is proposed that an official ceremony will take place to return the time capsule with copies of the original material along with present day artifacts which may be of interest at a later unveiling. This time it will be suitably marked, which should save some embarrassment at the next unveiling ceremony.